In May, 1940 the Umbria was loaded with various war-like commodities and ammunition such as 360,000 bombs, 60 boxes of detonators and other stores totalling 8,600 tons in preparation for the forthcoming Italian war effort and destined for troops already stationed in Italy’s East African colonies. On her way to Eritrea, and eventually onward to Calcutta, on June 3, 1940 she arrived at Port Said and on June 6 she continued on. She was closely followed by the HMS Grimsby of the Royal Navy. 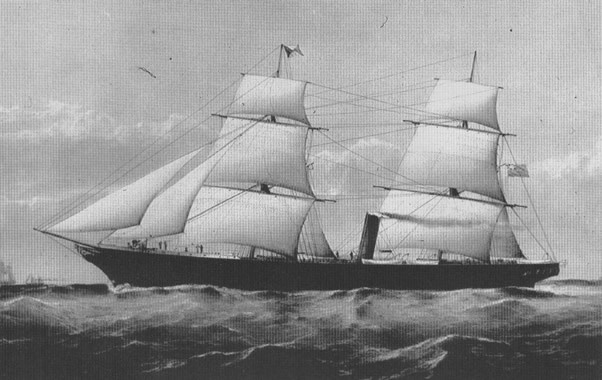 When she got close to Port Sudan on June 9, the Grimsby forced the Umbria to anchor close inshore by Wingate Reef. After having anchored the ship, the New Zealand battle-cruiser HMS Leander arrived and 22 men (including the captain) boarded the Umbria searching for contraband and stayed onboard until the next morning. The Umbria’s captain was listening to his radio that morning and heard the news that Italy had formally declared war. He wanted desperately not to allow his precious cargo to get in the hands of the British and decided on the best solution – on sinking the boat. They had to do it without the British getting wind of any of their activities. And they succeeded. The British noticed water filling the ship and the 2 captains ordered to abandon ship. Although salvageable, it was decided the ship would be left alone as her cargo posed an awesome danger. The Umbria lies almost exactly as she had reached her final resting place on the sea bottom – on her port side at Wingate Reef. The bows at 38m are the deepest part of the wreck. The stern and the rudder rest on the sand at 30m. The tops of the remains of its masts emerge from the water where birds are often perched. 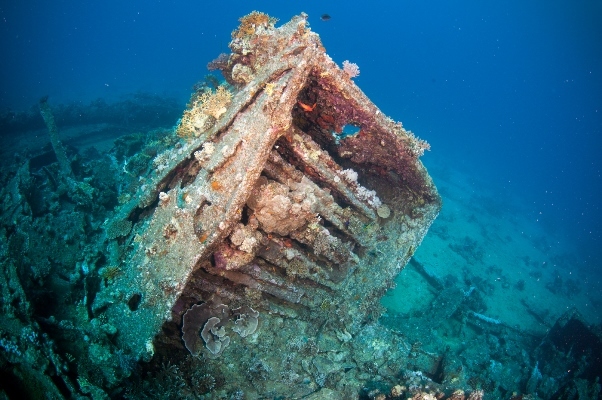 The massive superstructure with only its wooden decking missing, provides a variety of opportunities for divers to explore. The wreck is overgrown by colourful soft and hard corals abundantly and its fish life is bountiful. 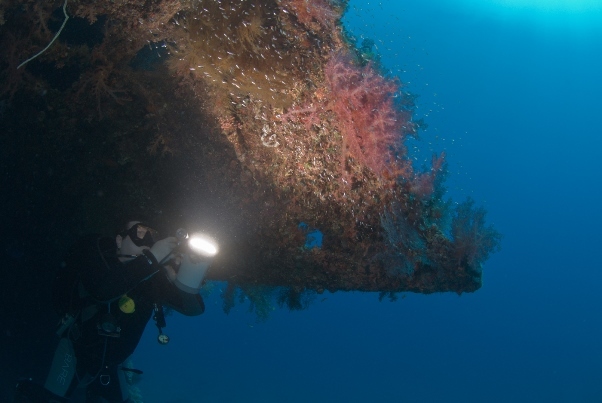 It is one of the world’s most beautiful wrecks to dive. It is rare to find ship wrecks that are almost completely intact and free of any signs of crash or collision. 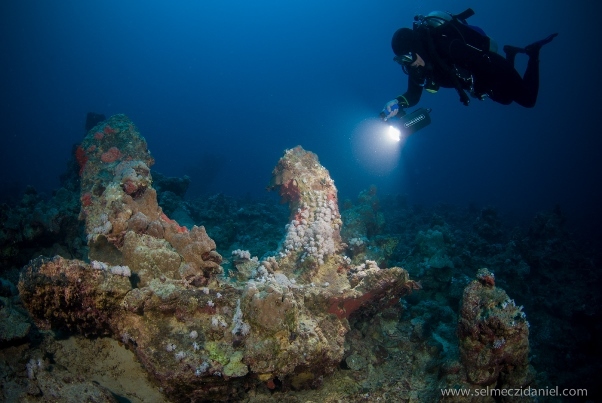 The ship was anchored when she was sunk and both her anchors can be found about 200m from the wreck. The main mast was near the forward deck which is now broken and lies on the seafloor. 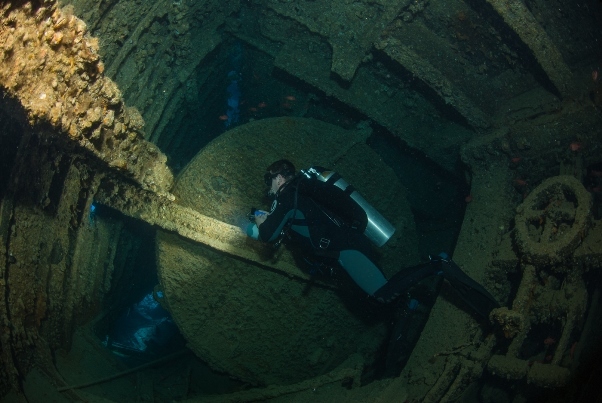 Due to the entire body of the ship being so intact and missing hatch covers, it is easy to enter the hull and the cargo holds to get a glimpse at the sunken treasure. In one compartment lie undisturbed the aerial bombs, detonators, rolls of electric cable, wooden boxes and storage jars still sealed. There are also bags of cement with have now solidified and stand as cement blocks. And there are the amazing Fiat 1100 Lunga motorcars, still very much recognisable. The area of the bridge is probably the one with the most damage due to the ship sinking and the natural erosion of the wooden decking and the effects of some powerful storms. Yet, it is also covered in gorgeous corals, making this truly a beautiful wreck to dive. This is the way to the staterooms with several cabins going along the sides of the hallway. The engine room can be entered from here however it is almost completely void of any light. Beyond the two huge engines are the two propeller shafts and nearby is a fully equipped workshop. 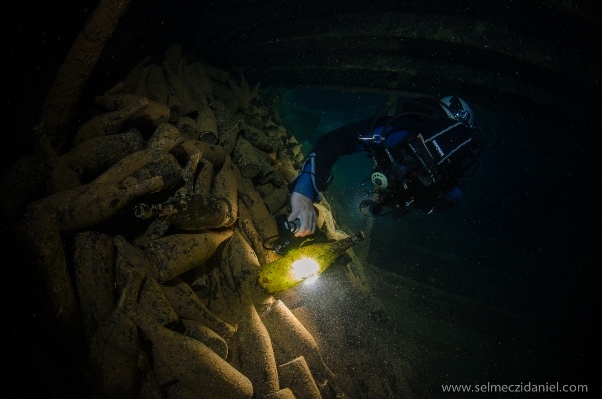 Once outside of the wreck, farther back is the easy access into the holds where the majority of the bombs lie, carefully stacked in long lines. It is a surreal experience to be witness to all this destructive power dormant for some many years. Farther in the back, one of the propellers is above the seabed and the other one is partly buried in the sand. Lots of snapper fish and sea lilies found home under the giant rudder by the stern. Lots of tiny comical cleaning crabs live near the collapsed funnel on one of the gangways which start to clean our hands if we put them on the bridge. 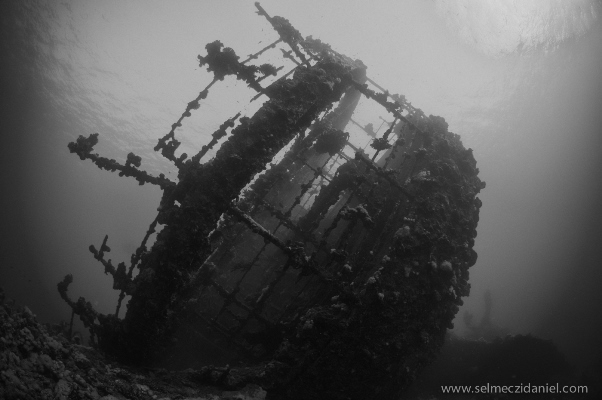 Around the wreck we can run into barracudas, butterflyfish, spiny fish and schools of tiny red fish. On the right side of the boat corals bloom like bunches of rosehip bushes. It is a truly rich wreck as in marine life as in history.